My mom sewed a new pair of pants for Roscoe! 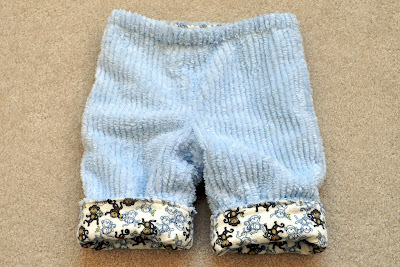 So warm and cozy, they are made from scraps leftover from his baby quilt. Powder blue chenille exterior, flannel monkey interior and a cuff to allow for growth. They are perfect for the winter. 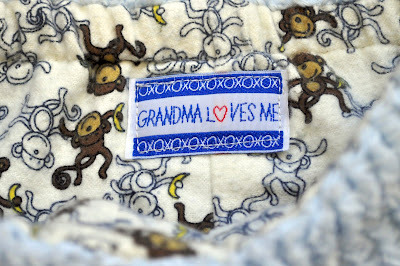 Would a pair of pants sewn by Grandma, just for you, be complete without a personalized tag? I don't think so! OH THE CUTENESS...It's overwhelming! When I see pictures like this, the decision to have kids seems like a no-brainer!